Understanding customers is key to driving a successful business strategy in the age of digital disruption, according to ANZ’s group executive of digital banking, Maile Carnegie. Speaking at this week's Australian-Israel Chamber of Commerce (AICC) event in Sydney, Carnegie said successful companies are the ones that have “an obsessive focus on delivering for the customer”. She explained the move to roll out ANZ’s Apple Pay was in direct response to customer demands. Carnegie was joined on the panel by Optus chairman and CEO, Paul O’Sullivan, along with Australia Post executive general manager, Andrew Walduck, who spoke on ‘Smart Disruption in the Digital Age’ and offered perspectives on innovation. 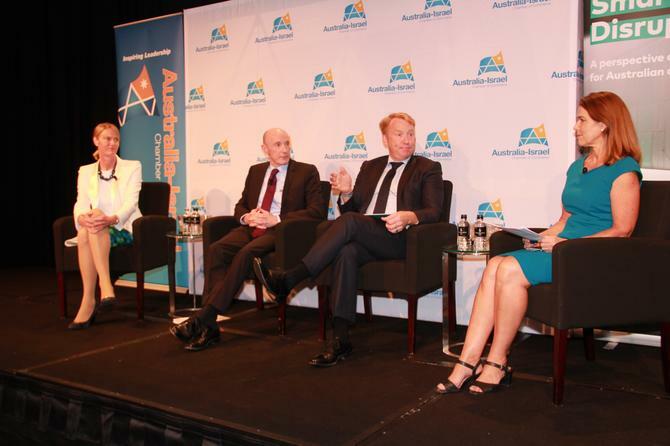 Panellists discussed how Australian organisations are facing unprecedented disruption and transformation. Carnegie said while innovation is so important to Australia’s future, and needs to be explored, the conversation needs to be considered from many different angles. “We use all sorts of words like disruption and innovation, which don’t actually mean anything to everyday people, particularly everyday people in parts of the economy which are incredibly challenged,"Carnegie said. "At the moment, the issue we are facing is that many everyday Australians are hearing disruption and innovation, and what they are hearing is job loss. So for me, this is a critical conversation because as leaders of the economy, we all need to figure out how we can have this conversation in a way where our community embraces it." Carnegie claimed Australia is vulnerable given there’s a dearth of innovation at the top end of town. “We are most vulnerable in terms of our large companies not innovating enough, and we don’t have a rich enough pool of start-ups to be able to offset what happens when the large companies [don't deliver]." “If you look at the Australian economy, Australia is incredibly good at knowledge creation, but we are very weak at knowledge transfer and knowledge application,” she said. Carnegie also urged the not-for-profit sector to get involved in order to help drive innovation and address disruption. O’Sullivan agreed disruption and innovation are essential elements to the Australian economy, and businesses need to address the seismic changes and collaborate and partner with other key stakeholders. Referring to an MIT study, The Atlas of Economic Complexity, O’Sullivan said economies that grow the fastest - and the cities that are most successful - are the ones that have the densest links between companies, both large and small, and between business and academia. O’Sullivan also offered up a key lesson on managing disruption. “If you want to know what’s happening in the tech world and how it’s impacting you, the best way to predict what’s happening is follow the money. Follow the money to understand what your customers’ needs are and where people are moving to develop things,” he said. Meanwhile, Australia Post is already on its journey of transformation, according to Walduck, who said change was inevitable and essential in order to survive in the age of disruption. “The world now is one where the rate of change has dramatically increased because it has been enabled by technology. And for those organisations that are exploiting this capability that now exists, plus changing their cultures changing inside of their companies, they can move fundamentally faster," he said. Agreeing data is essential to any organisation, panellists also shared their views about open access to data, as well as ownership and remediation.Walduck said the data discussion is not only timely, but vital to enter into considering the privacy ramifications and security challenges. “The whole discussion about data comes from this notion that I as a consumer don’t feel that I have control over it, and someone else is going to take it and then do something, and I don’t have any say, and as a result I am going to be disadvantaged,” he said. “For our organisation, we made a deliberate decision and what we’re doing about evolving some of our products now, where we will not use data in a way that an individual or one of our customers does not consent to be able to provide it. Carnegie expected there won’t be one single identifier when it comes to protecting digital assets from unauthorised use and access.